A record of our learning journey designing our Makerspaces / STEAM learning hub. Rm 3 2015. This blog is a replica or copy of the one created by the students and myself at Hunua School beginning in Term 3 of 2015 as part of my studies with The MindLab by Unitec. The reason for it being a copy is that when I left the school we didn't do 'Google Takeout' and my account is now deleted so some of the artefacts on the pages are not able to be read or photos viewed. I still have these so I've recreated them here as a record for all of us. If you'd like to read the comments, please go to the original blog at The Creator Ops STEAM. 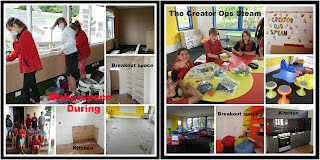 The blog and what we achieved was used as an example by The MindLab at Unitec to show what is possible when you let students loose, give them the skills they need and trust them to do the most awesome job to create a fantastic learning environment where creativity and imagination can flourish. The blog is largely the work of the students, in their own words. The design of the room - in an unused classroom - was also theirs. We went through the whole Design Thinking Process together. I was their guide and taught them the skills they needed but they definitely drove the whole process. It was an incredible amount of hard work - physically as well as mentally but it was the most amazing challenge. I think I spent most of Term 4 and definitely the whole of the summer break covered in paint! The room was finally completed at the end of Term 1, 2016. I am no longer at Hunua as I left to begin my PhD but, in the words of one of the very wise students... "With each new footstep comes a new idea" so I know the room will be put to great use as it's not about the room or the 'stuff' that's in it. It's about the ideas, the creativity and the collaboration that happens in that environment. It's always about the people and the opportunities and possibilities. If you'd like to read more about the journey along the more academic side, I've included links to my research and my own learning journey below.